Gov. Paul LePage speaks Saturday, Jan. 14, 2012, at an anti-abortion rally in Augusta, Maine as part of the annual "Hands Around the Capitol" rally and march. AUGUSTA, Maine — A battle is under way between the governor’s office and supporters of a citizens’ initiative that seeks to expand Maine’s renewable energy portfolio and focus more on energy efficiency. Maine Citizens for Clean Energy held an event Wednesday at the State House to announce that the group is nearly ready to submit the necessary signatures to force a statewide vote in November . If signatures are approved, Maine voters will be asked whether the state should require its utilities to get 20 percent of their power from renewable energy sources by 2020 and require them to invest in energy efficiency. The group also touted a recent poll of 600 Mainers that indicates roughly three of every four Mainers support the ballot initiative. At the news conference, the group said a survey of 601 likely Maine voters conducted in early October found that 76 percent of respondents support the ballot initiative, with 17 percent against and 7 percent undecided. The poll also showed support from a majority of voters enrolled as Democrats, Republicans and independents, as well as support from both sportsmen and nonsportsmen. Beth Nagusky, representing Environment Northeast, a partner with Maine Citizens for Clean Energy, said the initiative is smart because it is both environmentally sound and cost effective. Gov. 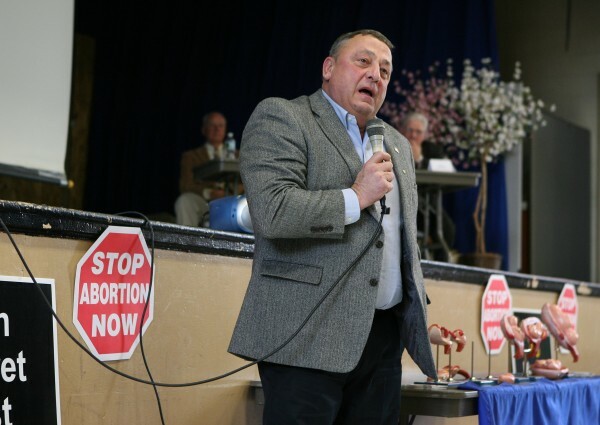 Paul LePage has come out strongly against the proposal, both in a recent weekly radio address and at public events. He said a study done by the Public Utilities Commission estimates the cost of the initiative would be between $40 million and $80 million a year and that Mainers cannot afford any increase in electric rates. He said he will do what he can to convince Mainers the proposal is bad for the state and should be defeated should the petitions be validated. He said he will speak about the problems he sees in the measure as part of his State of the State speech to the Legislature next week. He flatly rejected the assertion by supporters of the bill that ratepayers would benefit from the legislation. “They are lying to you,” LePage said. Nagusky said the PUC’s estimates don’t take into account the offset costs of more energy efficiency. She said electricity costs would increase initially but would go down over the long term and she pointed to an independent analysis that supports that. “Nobody has a crystal ball and can accurately predict energy prices, but we have looked at a range of assumptions in doing our analysis, and we believe it will lower prices over time,” Nagusky said. The governor also has expressed concerns that the proposal would give Efficiency Maine more control. Efficiency Maine is the quasi-state agency that works to improve energy efficiency for Maine businesses and residents. The governor and some lawmakers have said the agency needs more oversight, not less. As the renewable energy initiative appears headed for the November ballot, the rhetoric could ratchet up in the coming months. One prominent business, Reed & Reed, a general contractor based in Woolwich, has backed the renewable energy initiative because it has seen the benefits firsthand of efficiency and diversity.